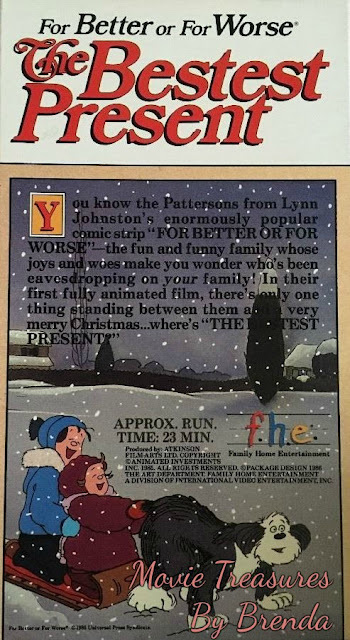 This animated Christmas special, For Better or For Worse: The Bestest Present, was created based on Lynn Johnston's popular comic strip, For Better or For Worse. It was produced for Canadian television in December, 1986, and follows the Patterson family as they get ready for the holidays. Of course there are lots of funny moments and a touching finale, which combine to make a lovely film with some voices supplied by Johnston's own children. This is a very popular Christmas television special that is not widely available on DVD. However, sometimes the videotape is available new and used through various sellers at Amazon and eBay although the rarity and popularity of this item dictates the price especially if someone finds a new copy. You can find your copy of The Bestest Present on Amazon by clicking here and on eBay here.